High-energy piping systems are essential to the safe and cost-effective operation within modern power plants. 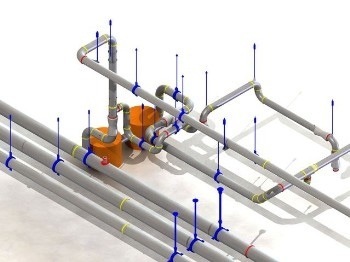 The propensity for piping problems and failures tends to increase with the age of the systems. Prolonged operation, particularly at elevated temperatures, may result in metallurgical degradation. Metallurgical degradation may increase the potential for cracking and crack propagation within a piping system until a final failure stage is reached. As a result, power plant operators have become increasingly cognizant of the importance of condition assessment evaluations for high-energy piping systems. Effective programs for monitoring and maintaining piping systems generally involve an initial preliminary inspection to confirm the current integrity of the components. The results will identify the positive/negative effects of continued operation of the systems involved and will then be evaluated. Periodic inspections and maintenance should be implemented to ensure the continued safe and efficient performance of these critical components, followed by re-inspections. Thielsch recognizes that this process can be an extremely daunting task and our experts are prepared to assist you with a plan. To learn more about the prioritization of inspection locations click here. The foundation of the prioritizing criteria is based upon internal statistical analysis of over 500 electric utility piping designs, inspections, failure analyzes and repair projects performed by Thielsch Engineering, Inc. over the past 40 years. To discuss your specific high-energy piping inspections and maintenance, contact Robert Smoske at rsmoske@thielsch.com or by phone at (440) 729-8866. For more information or an onsite demonstration of Thielsch’s 4-SYTE System Strategy Program please contact Pam Smoske at psmoske@thielsch.com or by phone at (440) 729-8866. You may also visit us on the web at www.thielschfes.com. Posted in High Energy Piping and tagged 4-SYTE, 4syte, condition assessment, Cost-effectiveness analysis, Energy, Fracture mechanics, HEP, High energy piping, Inspection, Metallurgy, NDE, nondestructive examinations, Pamela Smoske, piping, Power station, priority locations, Statistics, Thielsch Engineering. Bookmark the permalink.